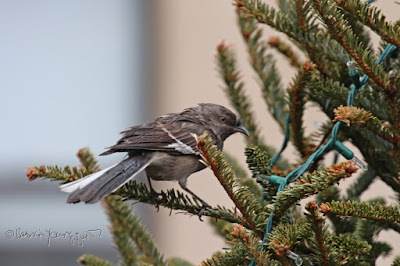 The Last Leaf Gardener: Wednesday's Wisdom: Outdoor Xmas Trees... are for the birds! 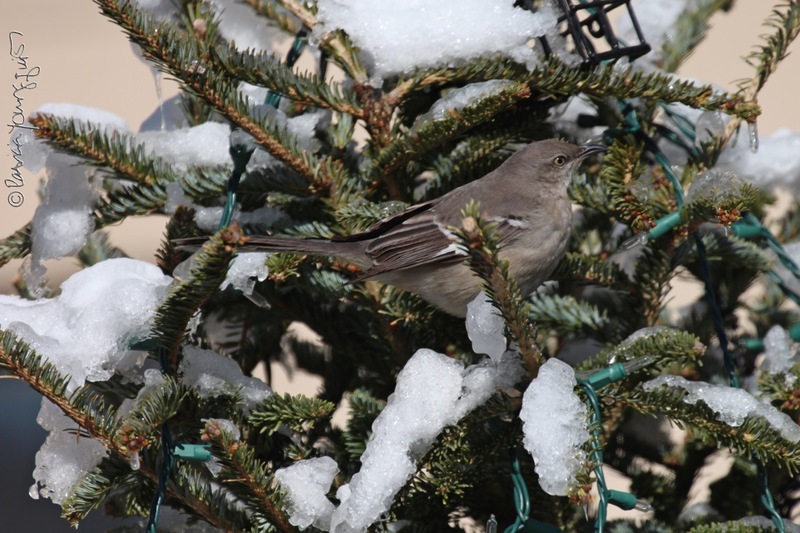 Wednesday's Wisdom: Outdoor Xmas Trees... are for the birds! 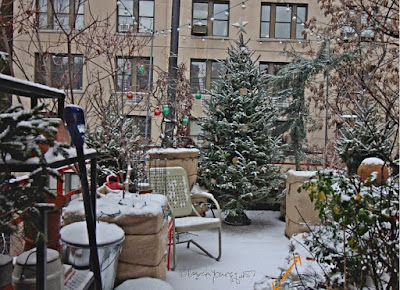 The photograph atop this entry features a Christmas tree that I had in my urban garden (which is on a rooftop in NYC) in 2015. I am thinking of putting up a tree for the 2016 Christmas season next week. 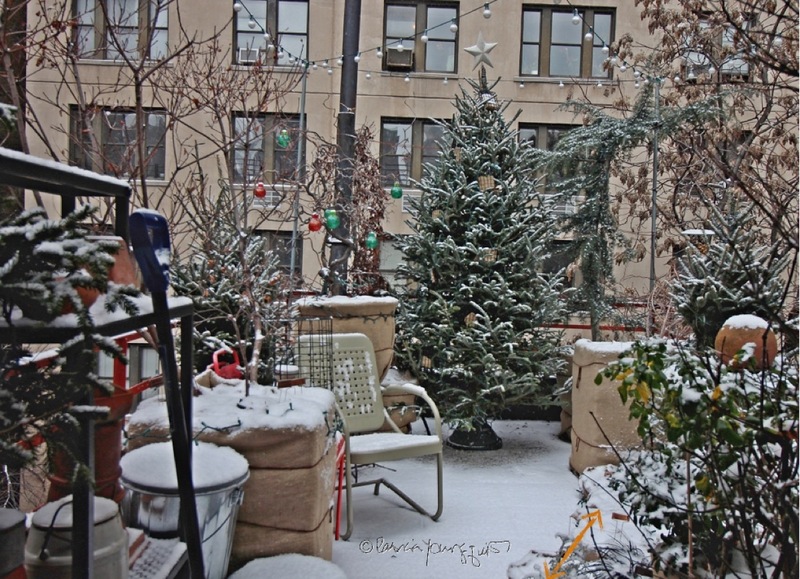 I have not done my garden winterizing for the 2016-2017 season, and that annual task is a prerequisite for putting up any holiday decor. This chore involves wrapping all my containers in bubble wrap, as well as burlap (from on-line fabrics), and then tying them with jute, before placing them in the southeastern corner of my garden (to protect them for the season). Btw, if you look closely at this image you will see an orange arrow (near to by signature) in the lower right corner. The arrow indicates the area where most of my winterized containers of flora are placed for a given season. 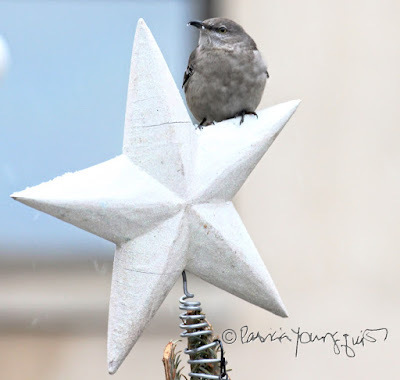 And if you look closely at my Christmas tree (topped with a star), you will notice that I have quite a number of ornaments on it which happen to be bird feeders (mostly suet basket varieties). My Christmas trees have become a place for an array of types of fauna (including a Harper, a Northern Mockingbird), to get food and keep warm. A few examples of this can be seen in the following pictures. 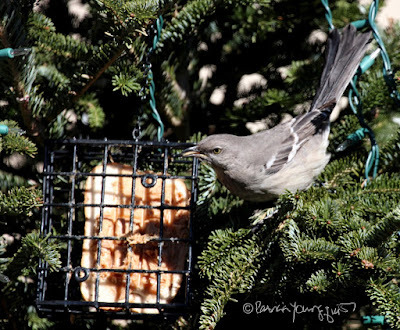 And I've been known to place slices of bread within the suet feeders (with peanut-butter spread on both sides of it) as a food source, for the birds need fatty food in the winter. 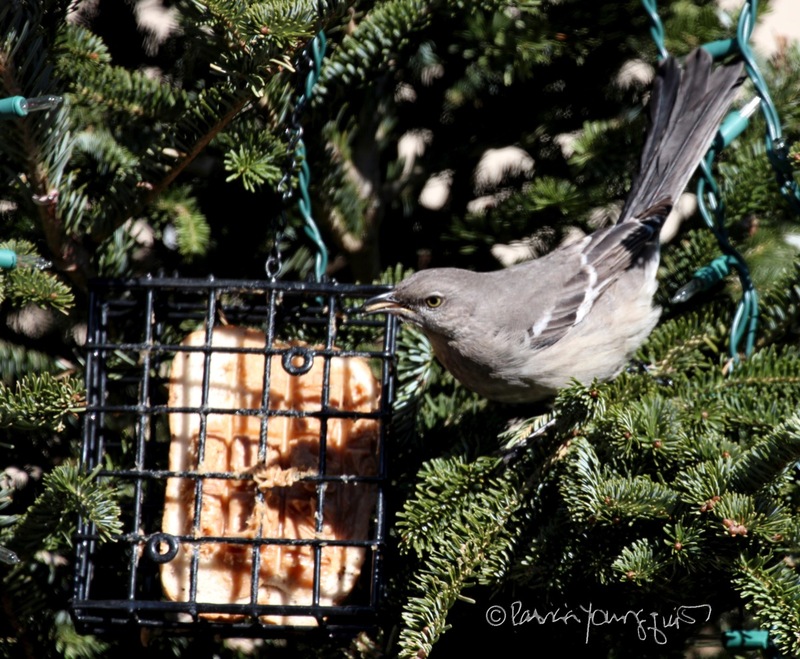 Many of my visiting fauna love an opportunity to eat peanut-butter, as evidenced by Harper, seen in the pictures below. Btw, birds not only enjoy spending time in my Christmas tree, they like to take advantage of my star-tree-topper as a perching place; as well as a spot where they can check out views of my hood. 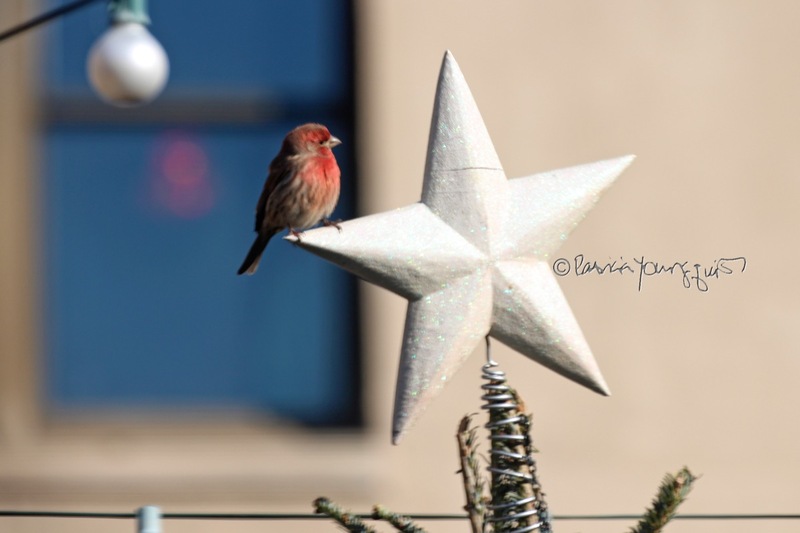 A number of types have done this, including Harper and a male house finch as seen directly below. 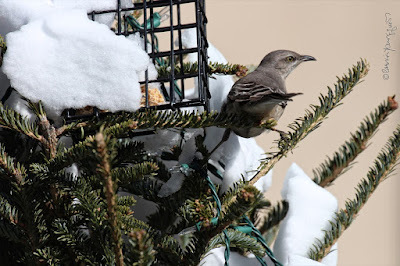 These days during my struggles to deal with issues re my eye-sight and complications re the nose injury I sustained in my accident; as well as the loss of friends through death or illness, I don't "feel" like putting up a tree, but I will do it! 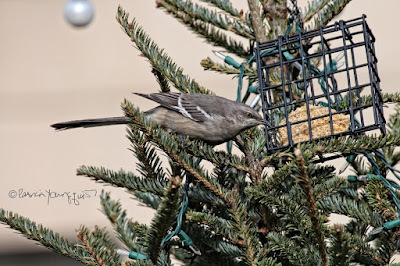 After all, Xmas trees are for the birds, and it's a small gesture on my part in "exchange" for the joy they bring to me! 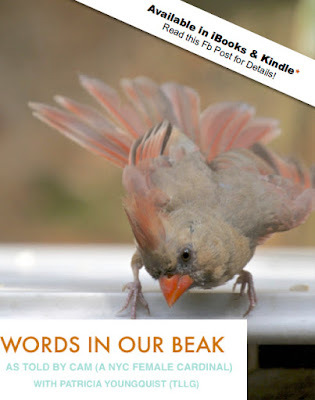 Btw, if birds give you, or anyone you may know, why not consider giving them the iBook or ePub version of Words In Our Beak Volume One as a holiday gift for Christmas, Chanukah, or Kwanzaa? 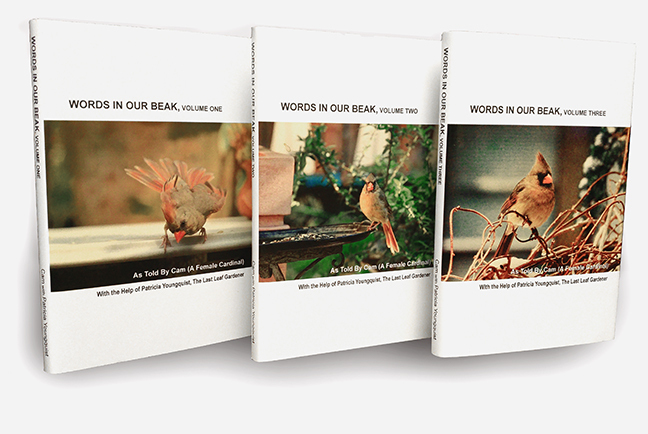 The book's goal is to open readers to a simple understanding of the winged world and their environment. Set in a rooftop urban garden (mine) n New York City, the story is told in the voice of Cam, a female cardinal, who visits it. 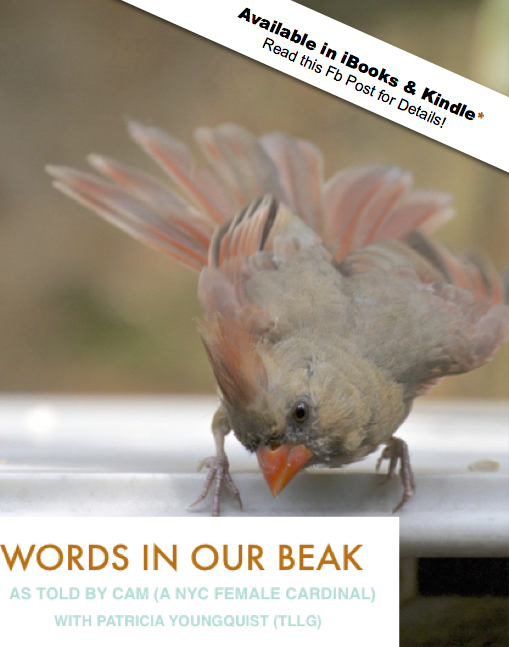 Words In Our Beak is directed to children and adults who are curious about birds, and want to learn about them from a unique perspective. The book includes hundreds of images of flora and fauna, links to movies, as well as to informative narratives that have been created by the author.